Zhiyi (Chinese: 智顗; pinyin: Zhìyǐ; Wade–Giles: Chih-i; Japanese pronunciation: Chigi; Korean: 지의; Vietnamese: Trí Nghĩ) (538–597 CE) is traditionally listed as the fourth patriarch, but is generally considered the founder of the Tiantai tradition of Buddhism in China. His standard title was Śramaṇa Zhiyi (Ch. 沙門智顗), linking him to the broad tradition of Indian asceticism. Zhiyi is famous for being the first in the history of Chinese Buddhism to elaborate a complete, critical and systematic classification of the Buddhist teachings. He is also regarded as the first major figure to make a significant break from the Indian tradition, to form an indigenous Chinese system. Born with the surname Chen (陳) in Huarong District, Jing Prefecture (now Hubei), Zhiyi left home to become a monk at eighteen, after the loss of his parents and his hometown Jiangling that fell to the Western Wei army when Zhiyi was seventeen. At 23, he received his most important influences from his first teacher, Nanyue Huisi (515–577 CE), a meditation master who would later be listed as Zhiyi's predecessor in the Tiantai lineage. After a period of study with Huisi (560–567), he spent some time working in the southern capital of Jiankang. Then in 575 he went to Tiantai mountain for intensive study and practice with a group of disciples. Here he worked on adapting the Indian meditation principles of śamatha and vipaśyanā (translated as "zhi" and "guan") into a complex system of self-cultivation practice that also incorporated devotional rituals and confession/repentance rites. Then in 585 he returned to Jinling, where he completed his monumental commentarial works on the Lotus Sutra, the Fahua wenzhu (587 CE), and the Fahua xuanyi (593 CE). Chappell holds that Zhiyi: "...provided a religious framework which seemed suited to adapt to other cultures, to evolve new practices, and to universalize Buddhism." Zhiyi and Bodhidharma were contemporaneous, though Zhiyi had royal patronage whilst Bodhidharma did not. Zhiyi's Lesser treatise on Concentration and Insight (Xiao Zhiguan/Hsiao chih-kuan) was probably the first practical manual of meditation available to the Chinese  and with its direct influence on the Tso-chan-i was very influential in the development of Chan meditation. Rujun Wu identifies the Great treatise on Concentration and Insight (摩訶止観, Mohe Zhiguan) of Zhiyi as the seminal text of the Tiantai school. Among Zhiyi's many important works are the Liumiao Famen, Words and Phrases of the Lotus Sutra (法華文句, Fahua Wenzhu), and Profound Meaning of the Lotus Sutra (法華玄義, Fahua Xuanyi). Of the works attributed to him (although many may have been written by his disciples), about thirty are extant. Zhiyi developed a curriculum of practice which was distilled into the 'Four Samadhis' (Chinese: 四種三昧; pinyin: si zhong sanmei). These Four Samadhi were expounded in Zhiyi's 'Mohe Zhiguan' (Chinese: 摩訶止観, Jpn. : Makashikan). The Mohe Zhiguan is the magnum opus of Zhiyi's maturity and is held to be a "grand summary" of the Buddhist Tradition according to his experience and understanding at that time. The text of the Mohe Zhiguan was refined from lectures Zhiyi gave in 594 in the capital city of Jinling and was the sum of his experience at Mount Tiantai c.585 and inquiry thus far. Parsing the title, 'zhi' refers to "ch’an meditation and the concentrated and quiescent state attained thereby" and 'guan' refers to "contemplation and the wisdom attained thereby". Swanson reports that Zhiyi held that there are two modes of zhi-guan: that of sitting in meditation 坐, and that of “responding to objects in accordance with conditions” 歷緣對境, which is further refined as abiding in the natural state of a calm and insightful mind under any and all activities and conditions. ...is critical of an unbalanced emphasis on “meditation alone,” portraying it as a possible “extreme” view and practice, and offering instead the binome zhi-guan 止觀 (calming/cessation and insight/contemplation, śamatha-vipaśyanā) as a more comprehensive term for Buddhist practice. The "Samadhi of One Practice" (Skt. Ekavyūha Samādhi; Ch. 一行三昧) which is also known as the "samadhi of oneness" or the "calmness in which one realizes that all dharmas are the same" (Wing-tsit Chan), is one of the Four Samadhi that both refine, mark the passage to, and qualify the state of perfect enlightenment expounded in the Mohe Zhiguan. The term "Samadhi of Oneness" was subsequently used by Daoxin. "Constantly Seated Samādhi" (chángzuò sānmèi 常坐三昧) - 90 days of motionless sitting, leaving the seat only for reasons of natural need. "Constantly Walking Samādhi" (chángxíng sānmèi 常行三昧) - 90 days of mindful walking and meditating on Amitabha. "Half-Walking Half-Seated Samādhi" (bànxíng bànzuò sānmèi 半行半坐三昧) - Includes various practices such as chanting, contemplation of the emptiness of all dharmas and the "Lotus samādhi" which includes penance, prayer, worship of the Buddhas, and reciting the Lotus sutra. The Flower Garland period – taught immediately after the Buddha attained Enlightenment, lasting 3 weeks. The teachings at this time were incomprehensible to all but advanced bodhisattvas, and thus Shakyamuni Buddha started over with more basic (the Agama) teachings. The Agama Period – taught at Deer Park, and lasting 12 years. These consisted of the most elementary teachings of the Buddha including karma, rebirth, the Four Noble Truths, etc. The Correct and Equal Period – lasting 8 years. This marks the Buddha's teachings that begin to transition from so-called "Hinayana" teachings to Mahayana ones. The Wisdom Period – lasting 22 years. The teachings here consist of the Perfection of Wisdom teachings among others. Here, the teachings were intended to demonstrate that the classifications of Hinayana and Mahayana were expedient only, and that were ultimately empty. The Lotus and Nirvana Period – lasting 8 years. The teachings of this final period mark the most "perfect" teachings, namely the Lotus Sutra and the Mahayana Nirvana Sutra, which encompass the Buddha's original intention. These were compared in order to the five stages of milk: fresh milk, cream, curds, butter and ghee (clarified butter). Together these were the Eight Teachings of the Buddha attributed to Zhiyi. 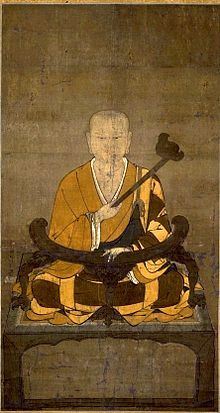 Zhiyi taught the principle of Three Thousand Realms in a Single Thought Moment (一念三千) (J. Ichinen Sanzen) in his 'Great Concentration and Insight', based on the Lotus Sutra. The number 'Three Thousand' is derived from the Ten Worlds, multiplied by ten [because of the Mutual Possession of the Ten Worlds], which gives 100, multiplied by ten [the Ten Factors listed in Ch. 2 of the Lotus Sutra which gives 1,000. 1,000 multiplied by 3 [the Three Realms of Existence: Self, Other, and Environment] which gives 3,000. Life at each moment is endowed with the Ten Worlds. At the same time, each of the Ten Worlds is endowed with all Ten Worlds, so that an entity of life actually possesses one hundred worlds. Each of these worlds in turn possesses thirty realms, which means that in the one hundred worlds there are three thousand realms. The three thousand realms of existence are all possessed by life in a single moment. If there is no life, that is the end of the matter. But if there is the slightest bit of life, it contains all the three thousand realms.... This is what we mean when we speak of the 'region of the unfathomable'. ^ Buswell, Robert Jr; Lopez, Donald S. Jr., eds. (2013). "Tiantai Zhiyi", in Princeton Dictionary of Buddhism. Princeton, NJ: Princeton University Press. p. 911. ISBN 9780691157863. ^ "天台宗の法要" (in Japanese). Retrieved 1 July 2018. ^ a b c Buswell, Robert E.; Lopez, Donald S. (2013). "Wushi" and "Wushi bajiao", in The Princeton Dictionary of Buddhism. Princeton University Press. p. 1003. ISBN 0691157863. ^ English Buddhist Dictionary Committee (2009). "Five Periods", in: The Soka Gakkai Dictionary of Buddhism. Delhi: Motilal Banarsidass. ISBN 9788120833340. Archived from the original on 26 February 2016. ^ a b Soka Gakkai Dictionary of Buddhism, Soka Gakkai, "Three Thousand Realms in a Single Moment of Life"
Donner, Neal & Daniel B. Stevenson (1993). The Great Calming and Contemplation. Honolulu: University of Hawai‘i Press. Swanson, Paul L.; trans. (2004). The Great Cessation and Contemplation (Mo-ho Chih-kuan, Chapter 1-6), CD-ROM, Tokyo: Kosei Publishing Co.
Thich Tien Tam, trans. (1992). Ten Doubt about Pure Land by Dharma Master Chi-I (T. 47 No. 1961). In: Pure Land Buddhism - Dialogues with Ancient Masters, NY: Sutra Translation Committee of the United States and Canada & Buddha Dharma Education Association, pp. 19–51. Chappell, David W. (1987). 'Is Tendai Buddhism Relevant to the Modern World? ', Japanese Journal of Religious Studies 14/2-3, 247-266. Dumoulin, Heinrich (1993). "Early Chinese Zen Reexamined ~ A Supplement to 'Zen Buddhism: A History'", Japanese Journal of Religious Studies 1993 20/1. Hurvitz, Leon (1962). Chih-i (538–597): An Introduction to the Life and Ideas of a Chinese Buddhist Monk. Mélanges Chinois et Bouddhiques XII, Bruxelles: Institut Belge des Hautes Études Chinoises. Stevenson, Daniel B. (1986). The Four Kinds of Samādhi in Early T'ien-t'ai Buddhism. In: Peter N. Gregory: Traditions of Meditation in Chinese Buddhism Vol. 1, Honolulu: University of Hawaii Press, pp. 45-98. ISBN 0-8248-1088-0. This page was last edited on 22 April 2019, at 02:18 (UTC).